Constantiaberg Holiday Rentals - 3 star Holiday Rentals in Constantia Valley, near Cape Town at Ascot Gardens, Constantiaberg. We provide safe and secure self catering holiday houses and holiday villas ,sleeping from 6 to 15 persons . Secure off street parking, private entrances and patios with BBq ,Free Wifi internet , DSTV and DVD. Walking distance to local shopping center and restaurants . 2 Bedroom 1 Bath room House sleeping 4-6 persons, or 3 Bedroom 2 Bath room House sleeping 6-8 persons. 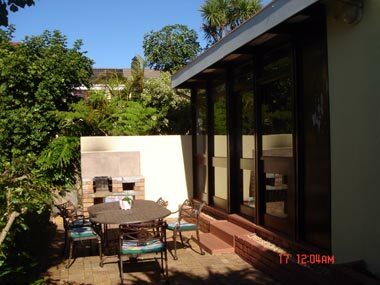 2 or 3 Bedroom House has a private entrance with an outdoor patio, garden table and chairs and BBQ facilities. Full large kitchen with stove oven and dish washer. The bedrooms and lounges have ceiling fans. DSTV satellite TV, bedside Clock Radio a music centre, DVD, VCR and a wall safe. There is also a shared swimming pool,sundeck, library , laundry and secure off-street under cover parking . This is the original ASCOT HOUSE that the Edkins family lived in from 1979 - 2002. The outdoor patio overlooks the Jungle Garden which was part of the original garden featured in the BBC TV "Gardeners World" programme. Spacious 2 bedroom House with 1 shared bathroom. 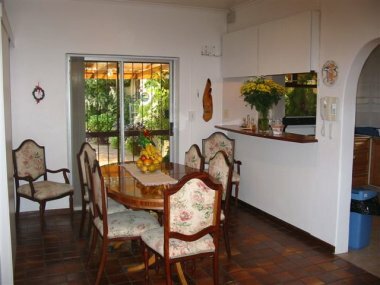 The Three Bedroom 2 Bathroom House is suitable for families of 4-6 to 8 persons. Shared full bathroom (with separate entrance doors) for main and 2 bedroom and 3rd bedroom has own bathroom ensuite. Main and 2nd Bedrooms sharing bath and shower bathroom entered via own separate entrance doors. These 3 separate units allow different sized families of 8 and up to maximum 10/11/13/15 persons to share and rent a house and this way be all together in the same house ,but still have their own private living area and own bedrooms and bathrooms . 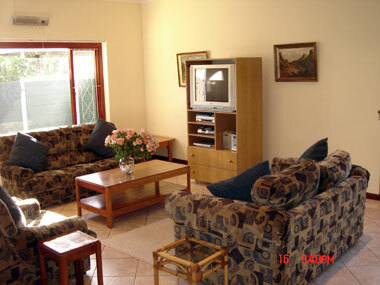 3 Separate Units all have kitchens and are fully equipped and furnished for self catering. In each unit we provide Free WIFI , your own DSTV, a music center, DVD, bedside clock radio, ceiling fans, safe. Private entrance with patio and outside table and chairs and own BBQ. Shared laundry facilities, a library with tourist info brochures and a swimming pool on site. All units surrounded by a beautiful 1 acre show garden. Bath Towels, bed linen, dish cloths, toilet rolls, dish washing liquid are supplied . A complete service of unit, including change of bath towel and bed linen is done each 7th day.The units are NOT serviced daily but we do remove your kitchen garbage daily.